You’ve written your email, scrutinised each sentence, and racked your brain for the best subject line. You click publish with a sigh of relief. Three days later, you peek at the stats. Your patients aren’t opening or clicking on your emails. And you’ve secured not a single new office visit. You’ve made your conclusion: Email marketing simply does not work. Well, you’re not alone. But the reality is email marketing is as important today as it’s ever been. You just have to take the right approach. Today’s email inboxes are congested. They’re filled to the brim with spam, advertisements, and uninspiring content. Increased competition has made it easy for emails to get drowned out. That’s why your campaigns must be backed by a meaningful strategy. They should follow best practices and attract attention in a way that patients can’t help but open and click. Improved retention: Serves as a reminder for patients to schedule their next appointment. More referrals: Boosts patient referrals by keeping your practice at the top of your patients’ minds. Email marketing achieves these goals in several ways. First, it builds trust. Sure, the best scenario in which you build trust is when a patient is sitting in one of your office chairs. But what about the 99.9 percent of the time they’re not sitting before you? Email is a channel to offer patients specific information related to their health or your practice. It’s a way to drive more website traffic, social activity, and new patients – and doing so with one of the highest returns on investment. 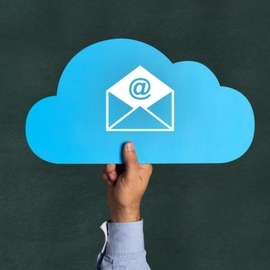 Email marketing nurtures relationships. It reminds patients you are thinking about them, while at the same time reminding them to think about you. That’s why putting yourself in your patients’ email inboxes on a consistent basis might be the reason they schedule their next appointment. Of course, achieving these goals isn’t just about hitting the “Send” button. Below are eight tips for building dental email marketing campaigns that generate more office visits. In the marketing world, branding is everything. It builds trust by ensuring that you are who you are. Your branding should be relayed throughout your campaigns. First, look at the URL of your website. Does it match your email address (i.e. doctor@abcdental.com.au)? Sending emails with a free email account (i.e. abcdental@gmail.com.au) not only appears unprofessional, it distresses your overall brand. All your marketing materials – brochures, postcards, website, etc. – should have the same look and feel. The same goes for your email campaigns. Include your logo and website colors in the header of your emails. This helps establish brand recall and assures patients that your emails are, indeed, from you. Today, well over half of all emails are opened on a mobile device. If a patient must zoom in and out to read your content, there’s a good chance it will go straight to the trash bin. Click-through rates plummet for emails that are not mobile-optimised. Also, keep in mind that the viewing screens of mobile devices are much smaller than a desktop computer. So be sure that your subject lines are concise enough that they don’t get cut off when viewed on a smaller device. Your email subject line is your first impression. If you don’t think it’s important, consider this: 33 percent of recipients open emails based on subject line alone. Boost your open rates by keeping your subject lines concise while also making them descriptive. It’s easier said than done. If it took you only 20 seconds to come up with a subject line, it’s probably not the right subject line. Remember, it should be compelling enough that patients can’t help but open your email. Evaluate your subject line with this free rating tool. A recipient marks your email as spam: If a reader doesn’t like your email, they can flag it directly within the email. This underscores the importance of providing value, and not just selling. An individual email appears spammy: Email provider algorithms will flag certain messages that cross some form of spam “threshold.” For instance, using all caps and words like “FREE” in your subject line can indicate spam. While the goal of your email campaigns is to fill more patient appointments, don’t be too pushy. If you’re constantly trying to sell patients on the appointment, they might unsubscribe from your list. 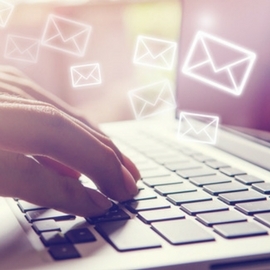 On average, consumers send and receive more than 80 emails each day. Attention spans are shorter than ever before. Not many people will read an email that has one large, 300-word paragraph. Keep your message concise, as not to flood patients with too much information. A focused message will increase the chance that someone will click. Frame your emails with headings, brief paragraphs, and bullet points to increase readability. Also, be sure to include at least one image to space out the content. Buying unsolicited email lists can spark a host of problems. Send emails only to people who have provided their address to you. It’s not only a courtesy. Consistently poor deliverability communicates to email providers that their customers aren’t interested in hearing from you. For example, if your open rates average 0.5 percent, providers might start sending future emails to the spam folder. Sure, effective email marketing is all about providing value. Again, the mantra of “give before you get.” At some point, though, you must call your readers to action. Say that you’re sending out a monthly newsletter. You introduce a new staff member. Then, you provide five tips on how to better maintain your oral health. Finally, you call your patients to action by reminding them that it’s important to visit the dentist every six months. Through email, there are a number of ways to stay connected with patients throughout the year. Whether it’s a monthly email or an occasional one-off message, email marketing reminds patients to think about you. In addition to more individualised messages, you can also run scheduled campaigns that run at specific times of the year (with the right email marketing software, you can even have these campaigns automated for you). Monthly newsletters: Send a monthly e-newsletter that educates patients. If you have a blog, you can excerpt posts and then link them to your website. New patient surveys: Your online reputation is just as important as your real world reputation. Send first visit surveys to new patients to gain feedback about your practice and promote online reviews. Birthday greetings: Birthdays are a time of the year when people tend to think about their health. Similar to newsletters, birthday greetings remind patients to think about you. Seasonal greetings: New Year’s, Valentine’s Day, and other holidays are a great time to reach out to patients. It shows that you care about them, not just their checkbook. Remember, the goal of email marketing for dentists is to improve patient retention and stimulate referrals. To keep your patients coming back – while making them loyal advocates of your practice – you have to nurture these relationships. Showing up in patients’ email inboxes with a valuable message is one of the best ways to achieve that. Want to branch out beyond your current patient database? 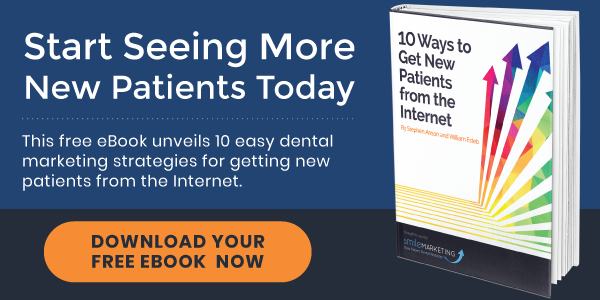 Download our free eBook below for 10 step-by-step strategies for getting more new patients from the Internet. « Can Your Dental Website Content Be Trusted?